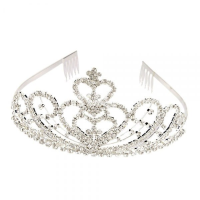 This simple and elegant silverplated tiara is made from rhinestones. The crown size is 6.89 inches in diameter x 2.36 inches at its highest point. 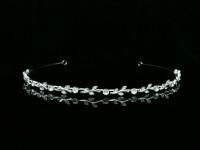 High Quality Clear Austrian Crystal Rhinestones, Silver headband tiara. Diameter is 5.5 inches. Height is 1/2 inches. 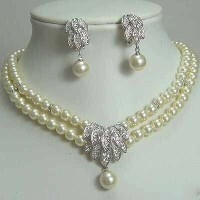 High Quality Clear Austrian Crystal Rhinestone, Faux Pearls and Silver Plated Metals make up this gorgeous set. Necklace is 18 inches + 2 inch extender. Earrings are 1 inch long. 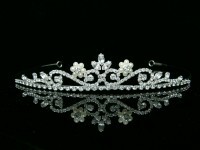 This flower style rhinestone tiara is 1.5 inches high in the center and the crown is 8 inches in diameter. Elegant and stunning! 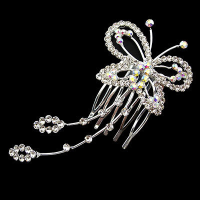 This exquisite butterfly style is silverplated and made from rhinestones. The crown size is 7.68 inches diameter x 2.17 inch at its highest point. Beautiful! 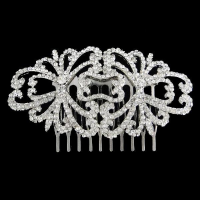 High Quality Clear Crystal Rhinestones hair comb. Size: 4" X 2" . 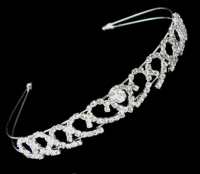 Fantastic hair accessory for Weddings, Proms, Parties or other special occasions .Beautiful and elegant pattern design. 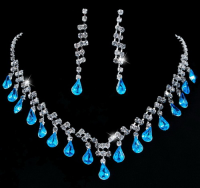 High Quality Clear Austrian Crystal Rhinestone 15 - 16 inch necklace with earring length of 1-1/2 inches. 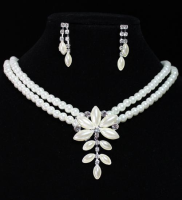 High Quality Clear Austrian Crystal Rhinestone and Faux Pearls comprises this set. Each necklace drop is 1 inch. Necklace length is 18 inches + 2 inch extender. Post Earrings are 1 inch. 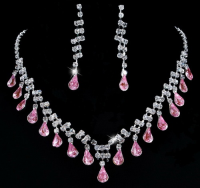 Austrian crystal 18 inch necklace with 3 inch drop pendant. Earrings are 2 inches long. 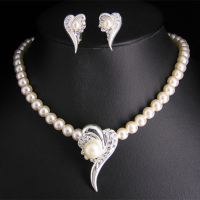 Austrian Crystal and Faux Pearl white gold plated is 16 inches long + 4 inch extender. The pendant drop is 1-1/2 inches long. Earrings are 1-1/4 inches long. 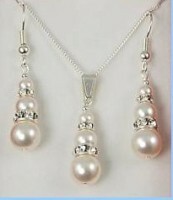 Size of faux pearl: 8 mm (earrings & chain) & 10 mm (pendant). Gorgeous! 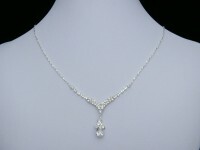 Austrian Crystal and Faux Pearl white gold plated pendant hangs on a16 inches long + 3 inch extender chain. The single pearl pendant drop is 1-1/2 inches long. Earrings are 1 inch long. 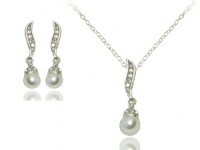 Size of faux pearl: 8 mm (earrings & chain) & 10 mm (pendant). Gorgeous! 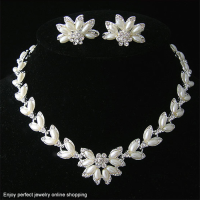 Elegant HIgh Quality Clear Austrian Crystal Rhinestone and faux pearl set strand is 16 --20 inches long. Earring size 3/4 inch long. 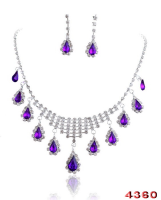 Austrain crystal dainty 18 inch necklace. Earrings (not shown) are like the pendant and are 1 inch long. 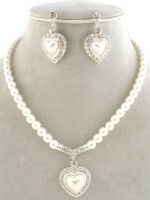 Dainty double heart of austrain crystal and faux pearls. Necklace is 16-18 inches long. Post Earrings are 1 inch long. 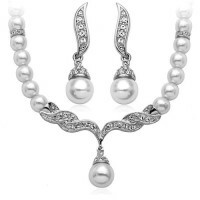 Swarovski crystal graduated pearl necklace set. Silverplated chain fine link 16 inch chain. Double row of faux pearls with center of elegant austrian crystals fashion this headband that is 5-1/2 inches in diameter. 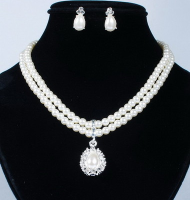 Austrian crystal and faux pearls 18 inch necklace with matching earrings that are 1-1/2 inch length. 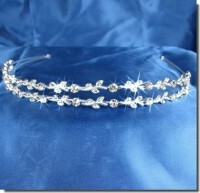 The sparkling tiaras is made with high quality Swarovski crystals in silver plated metal setting. 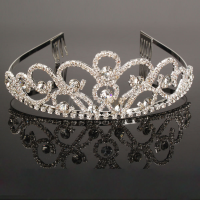 The pretty tiara measures 5.5 inches in diameter, it can be extended from 5 to 7 inches. Highest part is 1/2 inch. 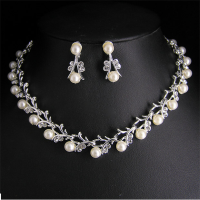 Lovely floral design tiara accented with high quality Austrian crystals and white faux pearls in a beautiful silver plated setting. The beautiful design measures 5 1/2 inches along the band and approximately 7/8 inch tall at the center. There are pin loops at each end of the tiara for extra security. This rhinestone crystal antique inspired bridal combt can be used for any special occasions such as wedding, formal evening party and proms. It is 3.86 inches long by 2 inches wide. 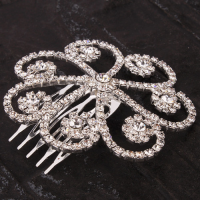 This romantic hair comb is beautiful with any hair style. 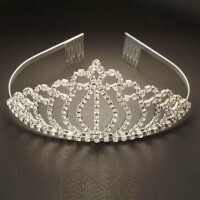 This clear and ab rhinestone tiara/comb is 4 inches long x 2 inches wide. 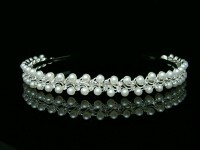 Perfect for a wedding, party and other special occasions. 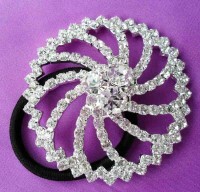 This fancy ponytail adornment will glamorize any ponytail. Perfect for any occasion. The rhinestone buckle is 2.4 inches long x 2.4 inches wide. 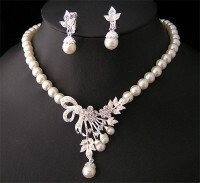 2 Rows of Faux Pearls with floral pendant and scattered rhinestones necklace set. Necklace is 15 inches + 3 inch extender. Post earrings are 3/4 inches. 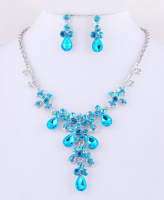 High Quality Clear Austrian Crystal Rhinestone, Silver Plated Metals; Necklace is 18 inches + 3 inch extender. Pendant is 2 inches long. Post Earrings are 1 inch. Outstanding set! 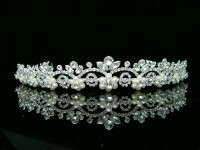 Bridal Flower Clear Crystal Rhinestone Silver Comb can be worn for weddings, proms, parties or any special occasions. Size is 4 inch X 2.5 inch. It can be worn with almost any hairstyle. Beautiful and elegant pattern design. 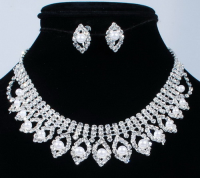 High Quality Clear Austrian Crystal Rhinestone, Faux Pearll, Silver Plated Metals comprises this set. Necklace length is 18 inches + 2 inch extender. Post Earrings are 3/4 inch. 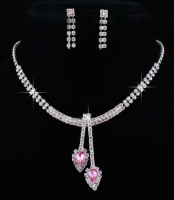 Austrian crystals adorn the hearts for an elegant look. Headband is 1/2 inches high. Diameter is 5-1/2 inches. 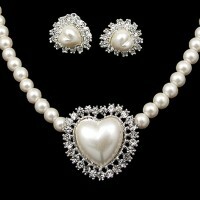 Austrian crystal and faux pearl 18 inch necklace with 1-1/2 inch heart drop. Earring length is also 1-1/2 inches. 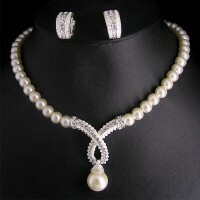 High Quality Austrain Crystal and Faux Pearl Set has an 18 inch + 2 inch extender necklace. Pendant heart is 1-1/2 inches. Post Earrings are 3/4 inch. 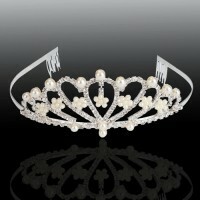 Multi floral design tiara accented with swarovski crystals and white faux pearls in a beautiful silver plated setting. The beautiful design measures 5 1/2 inches along the band and approximately 7/8 inch tall at the center. 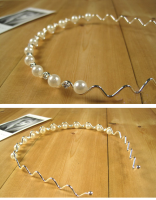 There are pin loops at each end of the tiara for extra security. This is a beautiful crown made from rhinestones & faux pearls. Crown Size is 6.50 diameter x 2.17 inch high. 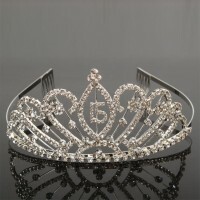 This silverplated rhinestone tiara is perfect for a 15 year old birthday party. The Crown Size is 7.48 inches diameter x 3.23 inches high. 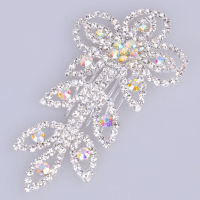 This high quality rhinestone flower shaped design comb is stylish and unique. This adornment is 2-3/4's inches in diameter. 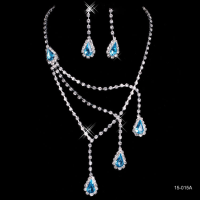 Perfect for wedding and other special occasions. 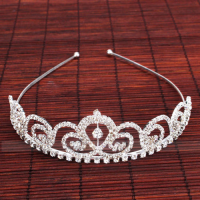 This romantic rhinestone tiara will look beautiful with any hair style. 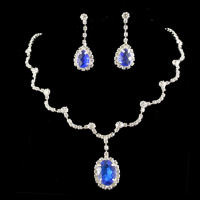 Its simple and elegant design make it fit for every occasion you attend. The Crown Size is 6.85 x 2.83 inch(W x H). Vintage 1970's brown faux pearl and crystal beads with gold findings. Necklace is 16 inch with 2 inch extender. 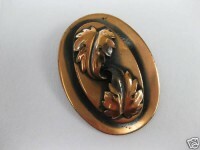 This is a great necklace pendant and a brooch pin. This is very good condition (no tarnish) and measures 2" x 1 3/8". 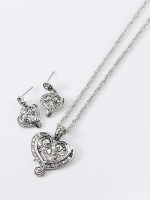 Comes with 18" black cord necklace with 2" silver extender so you can wear it either way. 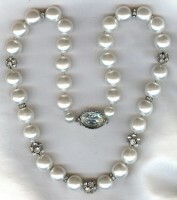 Vintage faux white pearls, clear rhinestone clusters and rondelles on black 24 inch necklace. Large rhinestone back clasp. Beautiful!